Patience is requisite of early adopters, who frequently learn about a pending gadget or device before a company is ready to begin widespread production. In this past year alone, that has been the case for numerous products, such as the Pebble and Basis smartwatches, the Memoto lifelogging camera, the Recon Jet heads-up display, and, of course, Google Glass. Selectees of the Project Glass #ifihadglass competition were notified that they had been chosen to participate in the Google Glass Explorer program at the end of March, about one month after the application deadline. After several additional months with no direct communication—and only an occasional, terse message encouraging patience on the Project Glass Google+ page (which has mysteriously purged its own post history)—Google finally announced on May 23rd that it would begin "rolling out invitations to successful #ifihadglass applicants." The process has been painfully slow; #ifihadglass selectees must pick up their Glass in person at one of three Google locations, and there are a finite number of appointments available each day. The "I/O explorers"—those who waited almost a full year from the time they placed their initial orders at last year's Google developer conference until their devices were ready for shipment—have all received their hardware, and many (most?) of the #ifihadglass explorers have, as well. A Google+ hashtag has gained notoriety as a designation for the remaining selectees: #glasswaiters. 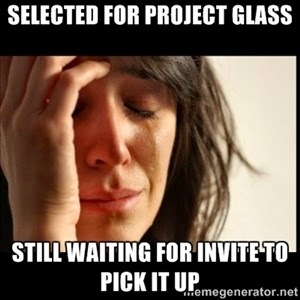 As a member of that group of future Glass Explorers, I am experiencing several emotions: excitement about being a part of the small group of initial users, frustration with the lengthy delivery process, and guilt about having that frustration (hence the first world problems meme). Mostly, I have giddy anticipation of traveling to the Google headquarters in Mountain View, California to pick up my own Google Glass, but I will indulge in a little constructive criticism of the way in which Google has handled the rollout of official purchase invitations before I offer my praise of the Project Glass team. Imagine you've managed to score a reservation to a popular new restaurant that, despite a handful of critical reviews, has gotten vocal praise from diners about the food and the service. You're thrilled about going, and you wait patiently in the crowded foyer. Although you were anticipating a wait—you know that there are many in the crowd who have reservations as well—you notice that the hosts and hostesses aren't communicating clearly with the patrons; many guests are asking what the wait time is, but no one can get a straight answer. The staff are unfailingly polite, and there are occasional reassurances that everyone will be seated soon, but you can't help but think that the seating could be organized a bit better. The #ifihadglass program is much like that. Despite the abundance of snarky message board postings and critical predictions about Glass, the reports from actual users (an admittedly biased group) have been overwhelmingly positive, as I wrote about previously. I'm very excited to be able to participate, and I'm more than willing to be patient; after all, the I/O explorers waited nearly twelve months, and I've only been waiting close to four. I also know that my time is coming soon, and I expect to "enjoy my meal," so to speak. Still, I believe that better communication about the notification process would allay the tensions felt by the #glasswaiters, a group Google definitely wants to be happy if they are to proselytize Glass. One way Google could have better handled the rollout of invites is to have followed the airline model. On most flights, passengers board an aircraft in designated groups: priority boarding for people such as uniformed military members, first class passengers, and passengers with handicaps, followed by general boarding in several distinct groups that are often designated by letter or number. Simply knowing that one is in a later boarding group makes it easier to wait. If I know I'm in the last boarding group, I will stay in my comfortable seat, enjoy a snack or beverage, and read to pass the time. Absent that information, I'd be resigned to anxiously gathering my belongings and standing uncomfortably in the crowd by the gate during those ten to fifteen minutes—much as many #glasswaiters have posted in the Glass Explorers community in Google+ about their anxious obsession with updating G+ notifications and checking to see if the Explorer landing page has changed. There has been much online speculation about the process Google is using to invite individuals to purchase their Glass, considering factors such as alphabetical order, #ifihadglass submission date, #ifihadglass selection date, and Google+ vs. Twitter applications. The Project Glass team could have mitigated the speculation and frustration some are feeling simply by being more forthcoming about the method behind the invitation process. This minor irritation aside, blogs and message board postings from those who've already picked up their devices have given the rest of us #glasswaiters exciting tidbits to enjoy while the anticipation continues to build for our own trips to Google. From the very nature of the program itself to the unique way the product is being distributed, the Project Glass team has put its stamp of "Googliness" on early adoption. John Dyer's Gizmodo article argues that that #ifihadglass competition was an effective marketing strategy because it tapped the imagination of potential users and invited them to create an exciting narrative. If Google, he writes, "can coax us to keep imagining and keep trying to tell and hear better #IfIHadGlass stories, then one day the once strange product will become a normal, unquestioned part of our larger cultural myth." By framing its early adopter program as a competition rather than a first-come, first-served e-mail list, Project Glass generated hype and garnered buy-in from early adopters who might have otherwise balked at the high initial cost. Spawning references to the highly-coveted Golden Tickets in Charlie and the Chocolate Factory, this approach was wildly successful in making the #ifihadglass selectees feel that they were part of something special long before any hardware came their way. The #ifihadglass applications were initially submitted either via Twitter or Google+, and the Project Glass team has built on that momentum by encouraging the use of these platforms and Glass-related hastags. While much of this is simply user-driven—the Glass Explorers and Society of Glass Enthusiast communities on Google+ are not affiliated with the company—Google employees sometimes contribute to such forums, with Sarah Price becoming a a respected go-to source in not only Twitter and Google+ but also question-and-answer site Quora. In her role as Community Advocate, Price "facilitate[s] conversations between community members and [the Project Glass] team." In the creation of such unique positions, Google has indicated its willingness to bridge the gap between engineer and consumer. Those who have already made the trip to one of the three Google Glass pick-up locations have praised the experience, noting that each individual is assigned a Googler to assist with the Glass color selection, fitting, and application set-up. They report that their guides did not make them feel rushed and were eager to regale the guests with tales about life at Google. While it seems to be more so the case at the Mountain View complex, Google appears to be open to and even encouraging brief escorted tours of its facilities. Even if those are limited to a stroll between buildings and such popular venues as the Googleplex's Android statues, they enhance the overall experience for the visitors and provide positive buzz by giving the new Glass Explorers an exciting story to share with those with whom they later discuss the product. Google is known for its fun-loving technoculture, and some amusing and touching stories have illustrated how the Project Glass team is composed of members with a taste for flair and showmanship. Marcus Menghini has shared one such tale, describing a surprise experience during his Glass pickup. In a glib and seemingly overlooked Google+ entry, he suggested that it might be fun to receive his Glass during a knighting ceremony. Unbeknownst to him, the Glass team prepared for his arrival, escorting him with fanfare through a pair of bowing Googlers before performing a swearing-in and knighting ceremony complete with sword. Once, when the carbonation from a much-anticipated swig of a freshly-opened can of Coke burned the inside of his nose, my father referred to it as "the pain that feels good." That's as good a description as any for what I and my fellow #glasswaiters are subject to. While I can grumble about the difficulty in arranging my summer travel and vacation plans without knowing when I will need to make my trip to California, I enjoy the excited anticipation of that event. The sweet pain of anticipation is the pain that feels good, indeed.